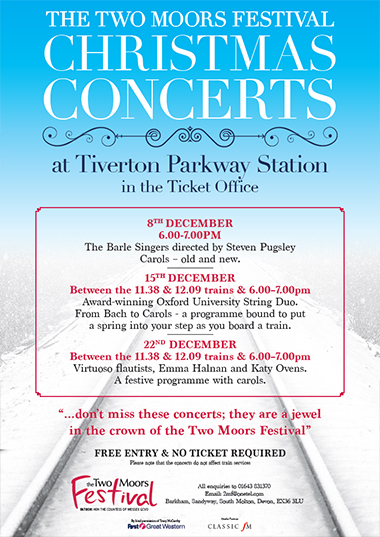 Avid followers of UK classical music festivals will no doubt have heard of our concert series that takes place in Tiverton Parkway train station down here in Devon – and we’re pleased to announce that it’s back once again this December for a very festive set of recitals. On December 8th, between 18:00 and 19:00, The Barle Singers will be taking centre stage at the train station, directed by Stephen Pugsley, singing all sorts of lovely carols… the perfect way to kick start the festive season, we’re sure you’ll agree. And then on December 15th, the award-winning Oxford University Duo will be putting on a programme From Bach to Carols between the 11:38 and 12:09 trains, and then once again between 18:00 and 19:00. Finally, on December 22nd, a festive programme with carols will be put on by virtuoso flautists Emma Halnan and Katy Ovens between the 11:38 and 12:09 trains, and later in the evening between 18:00 and 19:00. These concerts have proven so popular over the years so if you can make it to one – or all – of them, please do. All three are free and unticketed so even if you don’t have a train to catch, pop on down to Tiverton Parkway if you’re in the area to really get yourself in the yuletide spirit. If you do go, we’d love to hear what you thought and if you take any photos, please do share them with us over on Twitter or Facebook. Merry Christmas, everyone! For even more information about what the Two Moors Festival does, visit our website today. After 33 concerts in ten days, I am not sure whether to be relieved that the whole lot has been and gone without too many blips, or grateful to be able to catch up on some much needed sleep. One thing is for certain and that is being ecstatic about the astounding level of artistry at this year’s Two Moors – as the many followers of UK classical music festivals who attended will surely attest to. The most important thing of all, I think, is that the audience, regardless of age and musical knowledge, went home on a high as a result of listening to music played at the highest possible level. In fact, it could not have been more so. The standard of performance could not have been surpassed anywhere and people in the south-west were privileged to hear such sublime playing. The artists, without doubt, were inspired to give their best. They were given outstanding TLC, with many commenting on how much difference it made to be looked after as people as opposed to being taken for granted as employees. We think it is most important that performers are offered hot food plus anything else that they might require, whether it be a hot water bottle or a toothbrush. An overriding comment this year has been the unique atmosphere to be found at a Two Moors Festival concert. This came in the form of attentiveness of the audience together with the silence that was apparent at the end of a work or the performance itself. The artists, right across the board, remarked on this as well, saying that this reaction was true inspiration for their performance. On to more light-hearted things that happened this year: the Artistic Director got locked in the loo in Dunster, two artists tapped in the wrong postcode and finally arrived at their destination 25 minutes before the starting time of their concert, the handles fell off the back door thus making it impossible to get into the house, the shock absorbers went on the car, the heating broke down in one church so it was so cold that you see your breath – and so on. It would be extraordinary if there weren’t things that went wrong. One crucial thing to say is a BIG thank you to all those valiant volunteers who gave so much support. Without them, the festival would not have operated. Thank you also to all those wonderful artists who, by their performances, brought much joy to their listeners. Thank you to all the super people who came to the concerts – your rapturous applause after each concert said it all! So to next year – our 15th anniversary. The dates are 15th – 25th October 2015. We hope to see you there! Visit our website for further information and follow the blog for updates. So that’s it for another year! The Two Moors Festival 2014 is done and dusted, but what a resounding success it was! If you’re missing it already, have a look at some of the photos from this year’s event. We’d love to see any pictures you took as well, so please do share in the comments below. Alternatively, you can get in touch with us over on Facebook or Twitter. Don’t forget to follow the blog if you want to be kept up to date with all the Two Moors Festival news and to find out more about what’s taking place in 2015. It’s our 15-year anniversary, so you can bet there will be lots of even more amazing concerts being put on. Two Moors Festival 2014 So Far! We’re over half way and what a festival it is! I should be in Dunster already for today’s barrage of recitals – song/clarinet; Carducci Quartet with Jayson Gillham; Imogen Cooper (no less) in the evening. I felt, however, that five minutes spent writing a blog would be a good idea. Anyhow, I need a small break in the conveyor belt of concerts to collect what grey cells remain. We have amassed 20 events so far with 13 to go. The Box Office phone hasn’t stopped ringing, tickets have been selling at speed and all the concerts have been an amazing success. Of them all so far, the one that sticks out in my mind is the one on Saturday in Exeter Cathedral. Agata Szymczewska’s utterly astonishing playing of the Bruch violin concerto with the Orchestra of the Swan under the baton of brilliant young Israeli conductor Gad Kadosh was quite extraordinary. Sometimes one reads about concerts that have excelled themselves beyond expectation and you know that its description has gone over the top. On this occasion it happens to be true, with every member of the audience in agreement with me. The church service on Sunday was most moving. The sermon given by the Dean of Exeter Cathedral, Dr Jonathan Draper, focused on the gift of music and how it can have a profound effect on all aspects of life. It truly was inspirational. We have already received some letters of appreciation, which have inspired even greater passion in what we do and even if we’re dead on legs by the end, never mind. On which note, I really had better hit the day and gear up for spending the day in the gloriously picturesque village of Dunster with its superb (and acoustically excellent) church. If you follow us and other UK classical music festivals, then you’ll likely have heard of our innovative concert series that take place each year in the waiting room of Tiverton Parkway station. And if you haven’t, then chances are you will soon as they are catching the attention of music journalists around the UK, including BBC Music Magazine’s Jeremy Pound. You can read about his experience at the concert on the BBC Music Magazine website. We’re hoping to put on some more concerts come Christmas time, so if you missed our autumn series don’t worry. Follow us on Twitter or keep an eye on the blog for further announcements. To find out more about the Two Moors Festival, visit our website today. As followers of UK classical music festivals will know, the Two Moors Festival has over the last few weeks been putting on concerts in the waiting room at Tiverton Parkway Station, with a capacity audience attending the final performance last week (October 10th). A stranger venue would be hard to find but the ticket cffice at the station has proved to be one of the finest concert halls in the area. And why? Because it has fabulous acoustics. Word has spread and the fact that dedicated music lovers are prepared to travel from Widecombe and Ottery St Mary says it all. To round off the series of six events, professional harpist Elizabeth Scorah delighted her listeners with a specially designed programme that included a Bach suite, fitting exactly into the allotted time of 29 minutes between two morning trains. Two high-speeders rattled through in the middle of a minuet, passengers trundled their suitcases on to the platform, business at the coffee shop was brisk and the station continued to operate throughout as if nothing unusual was taking place. Dogs were lulled into a happy doze, toddlers were more than content having a cuddle with mum and the floor was so clean that it was quite normal for people (including the artistic director Penny Adie) to sit cross-legged on the tiles while enjoying the music. A further bonus of the series has been the voluntary collection in aid of the Festival’s primary schools workshop programme whereby professional musicians entertain and introduce children to the joys of classical music. Like everything, the project costs money and the total amount of over £300 raised will go a long way to ensure the scheme can continue. First Great Western and its staff are thrilled with the way in which the concerts have been received, have been so welcoming and word has it that they would like more. Is Christmas on the cards? A hearty sing of carols might beckon so keep a look out! Would you like to come along to hear a Festival production at the station come Christmas? Let us know in the comments below! And you can find out more about the Two Moors Festival over on our website. If you follow UK classical music festivals closely, then chances are you’ll have come down to Devon in October to hear some of the amazing concerts that we here at the Two Moors Festival puts on each and every year. This part of the world is beautiful at all times of the year (we are really lucky to have been able to base the festival’s headquarters in the very heart of Exmoor! ), but we do think it’s at its best during the autumn, when the leaves are turning and the light is absolutely stunning. To show you just what we mean, we thought we’d round up some of our favourite pictures of Devon in autumn from around the internet. If you’ve got any pictures of the county looking lovely at this time of year, do share with us. And we hope to you at this year’s festival, taking place between October 15th and 25th.